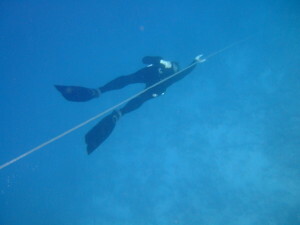 Freediving or apnea is the sport, science or art of holding your breath while being underwater. Many of us are familiar with snorkelling or scuba diving. Snorkelling is usually on the surface and freediving simply involves holding your breath, diving down and swimming around under water. It can be 1 metre deep or 50 metres deep and for a few brief seconds or minutes at a time. We take the view that you have two types of freediver competitive and recreational but it’s hard to categorise this sport in to simple types. Most people fall into both camps anyway. Recreational is just that, the diver enjoys the liquid element and doesn’t worry how deep they are going or how long they are staying under. They simply enjoy the relaxed feeling, the sights and silence of being under water. A competitive freediver is someone who actively trains and competes at the various competitions around the world. Of course very often these two “types” are mixed. I have competed at competitions but would see myself as more of a recreational diver and I attend competitions to see friends and learn more as well as the total experience besides they are usually really great craic. In competitive freediving then there are several disciplines broken down to pool and open water. I have listed the current records and holders as they were when this was being written but they change regularly. You can see the most up to date at the Aida International website. In the pool you have Static (Sta) which is holding your breath as log as possible while not moving.The current record is Stephane Mifsud with 11 minutes 35 seconds. Then dynamic with fins (DYN) 250m Alexy Molchanov and without (DNF) 213m held jointly by Dave Mullins and Tom Sietas which is finning or swimming underwater for as far as possible. In open water we have several, the most popular is constant weight (CW) where the diver dives down to a predetermined depth and retrieves a tag from the bottom plate. If he takes 5kgs on his belt he must return with 5kgs. This is currently held by Herbert Nitsch at 124m. We also have constant weight no fins (CNF) which is the same but no fins and is possibly the most pure discipline. This is currently held by William Trubridge at 95m. Variable weight is where the diver uses a weight to bring them to the depth but returns by either finning back up or pulling up the rope. The record is 142m by Herbert Nitsch. Free Immersion (FIM) is where the diver pulls up and down the rope using their arms only but again carries the same weight down and back. this record is 120m currently held by Herbert Nitsch. Lastly is no limits. (NL) This is no longer run at competitons but individual divers do hold their own record attempts in this discipline with correct judges present. It is the deepest discipline and pretty much anything goes. Initially the idea was to ride a weighted sled to the depths and return on an inflated lift bag. Recently Herbert Nitsch has changed this slightly by using an encased flotation device that surrounds his upper body. When released from the sled he automaticly surfaces due to its bouyancy. Herbert also currently holds this record at 214m. Fit yourself in where ever you would like to be. Its your life and your Ocean.